As an estate agent you will know that selling and letting property is a very competitive business, so it’s important to create the best impression. We can help you stand out from the crowd with our comprehensive selection of property signs and graphics that will help give your properties the edge. All of our property boards and hoardings are printed to the highest quality using long lasting materials. The vast majority of estate agent boards are made with Correx, fluted polypropylene which is light and cost-effective. However, we also print onto foamex and an aluminium composite called Dibond for some of our other property signs such as new development entrance boards and continuous site hoardings. CSDPrint has developed a great package for estate agents that focuses on giving you the best service possible. Do you know your Flags from your Ts? Over the years we’ve printed thousands of property signs – for sale, sold, to let, let – and in the vast majority of cases they have all been either Flag or T Boards. Flag boards – the ones with the post at the side – are very flexible and a little bit more cost effective. They take up less space and can be easily be fitted directly to the property if needed e.g. terraced houses. So if you are marketing a broad range of properties you might wish to consider having Flag boards. T boards – these are the ones with the post down the middle, hence ‘T’ in appearance. The correx signs to the front and back of the post need to be welded together and therefore T boards cost a fraction more. However, the upside is that these signs really stand out. If you are marketing high-end, semi or detached houses these could be the ones for you. You could, of course, have a combination of the two as many of our clients do. If you’re looking for estate agents boards and you’re not quite sure what format you need then please do give CSDPrint a call. 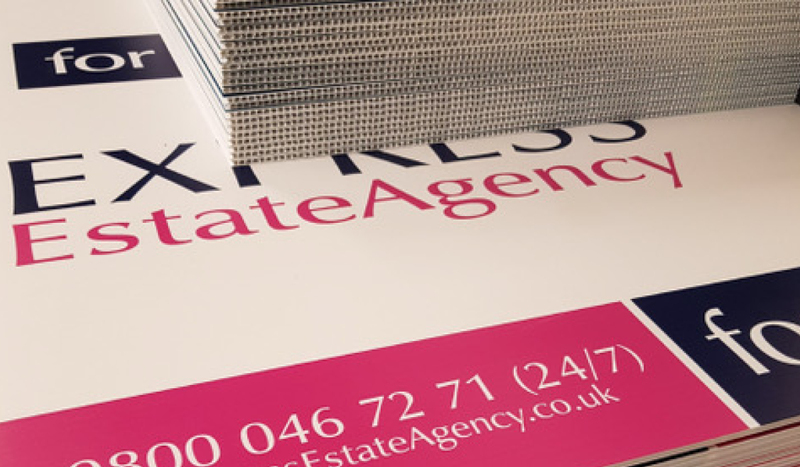 All our estate agency signs are printed in-house and whether you need a new batch of for sale boards or linked advertising hoardings, we offer a very hands-on personal service. We’ll make sure ordering your estate agent signs is as stress free as possible.